Normally I would show the card I made for my MIL before Mother’s Day, but she reads my blog and I didn’t want her to see it until she got it in the mail. The idea here can be modified for any holiday or occasion, just change the sentiment. 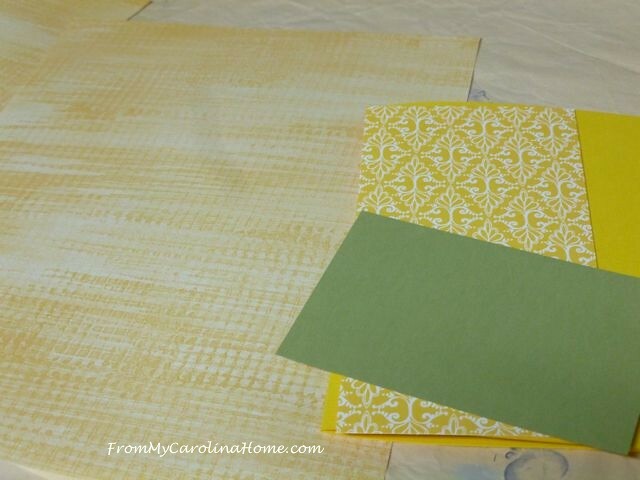 I decided on yellow when I pulled out one of the packs of patterned papers, so I pulled a coordinating yellow base and cut an oversize card to fit an envelope. I had these bird stickers too, and she loves birds. I wanted a texture look on the inside, and this yellow did well. The green was for contrast for the stamped image. I took the paper to the computer to print out a nice sentiment as I did not have a stamp that said what I wanted it to say. There is a wonderful website with free verses to print and use – Imag-e-nation. I selected Mother’s Day from the extensive list of occasions, and scrolled down the verses with DH to pick the perfect one for her card. The paper with the sentiment was cut to the size of the card and glued down. A goldfinch sticker was added. 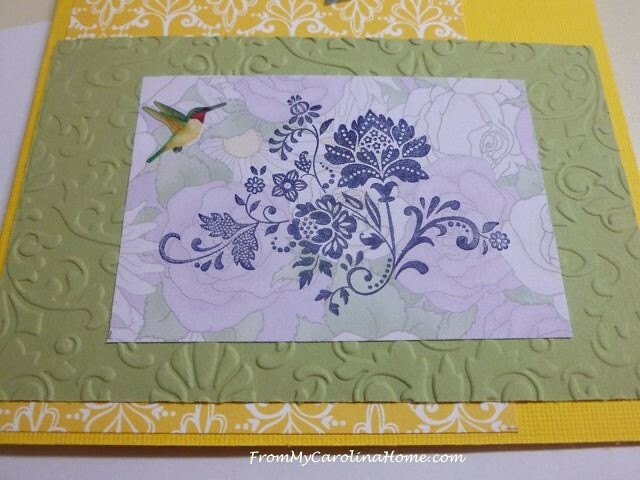 Another pretty paper was stamped with a floral image. 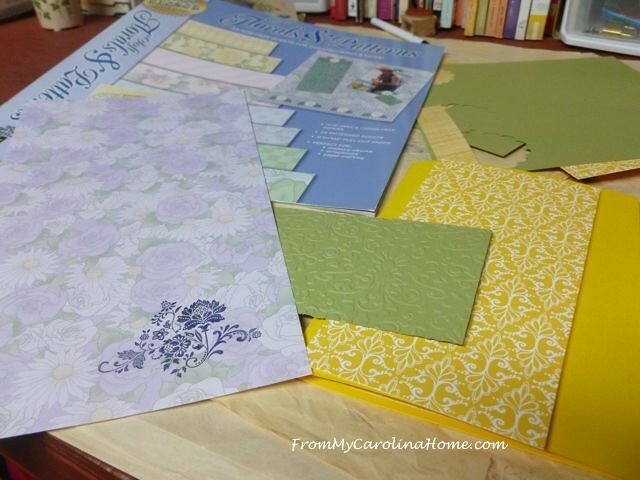 The green frame cardstock was embossed for texture. 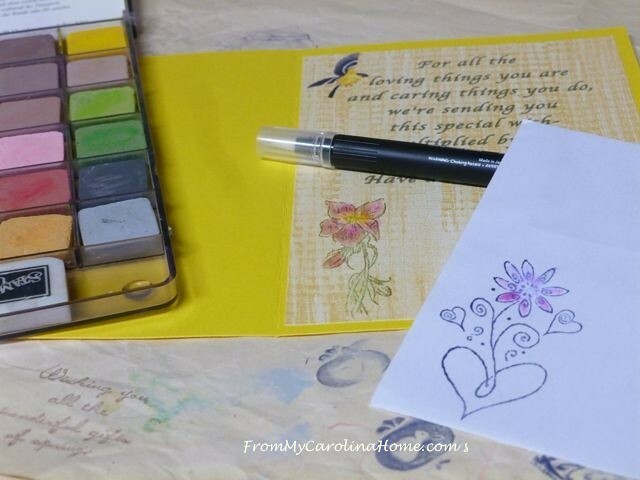 I stamped a flower on the inside, and on the envelope, and colored them using my chalks and blender pens. The stamped image was mounted on the green embossed cardstock, and positioned at the bottom of the card front. A little hummingbird sticker was added for extra interest. 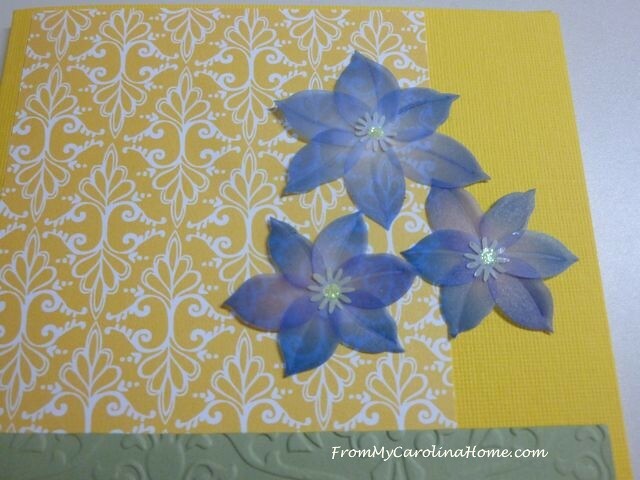 The top of the card front looked a bit bare, so these dimensional flowers were added. 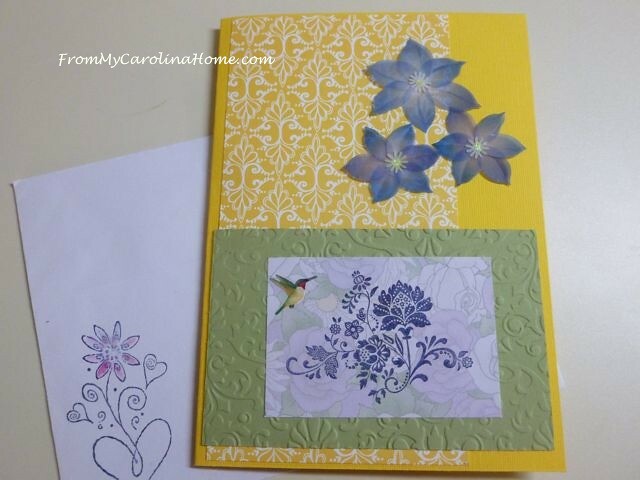 A floral and songbird card for a lovely MIL, here is the finished front and envelope. Naturally, I put my signature stamp on the back. 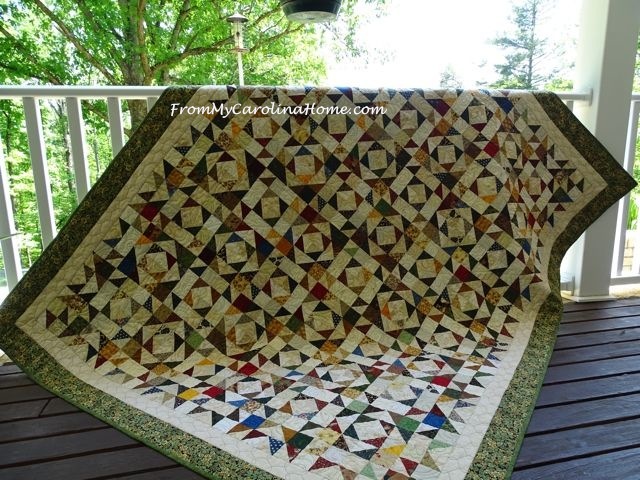 Linking to Just For Fun May Challenge – A Mother’s Love. Did you have a nice weekend? If you are a mom, how was your Mother’s Day? Nice! 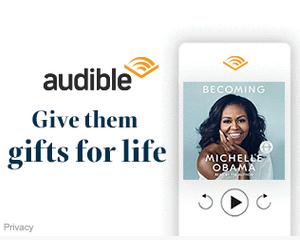 I bookmarked that web page–will definitely come in handy. Really pretty. I’ve been appreciating hand made cards more and more. Lovely! Thanks for the link to the site. I’m always stumped with what to put in cards. 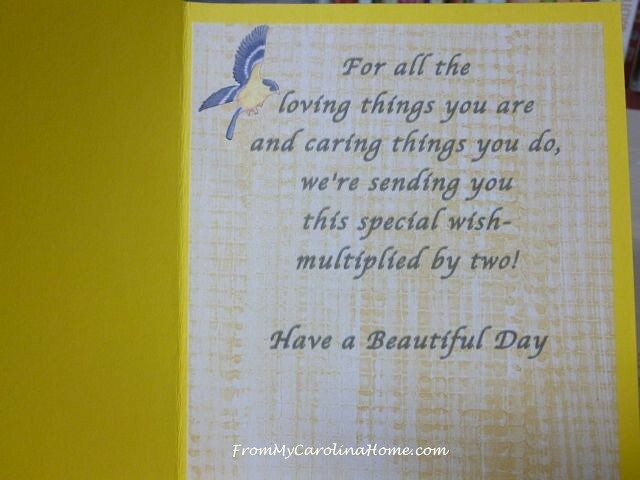 Another lovely card, Carole. Have caught up with some of your earlier posts and I have to say that your garden and all your plants are lovely. 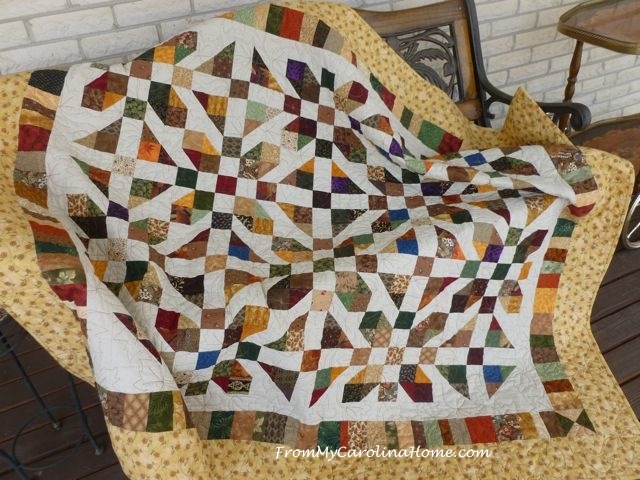 Love the quilting you did on the charity quilt. Hello Carole! This is a really pretty card that you created! Every choice you made did make such a difference in adding to its beauty. Yet, when you would begin to say and then I did this…my thought was “Why would you change it? It is so pretty the way it is right now?”. I should know by now that your artistic abilities in seeing the beyond is why your cards and so many other aspects of your artworks are so beautiful and unique! Your Mother In Law is going to love receiving this card and the lovely saying you and hubby picked out. I will share that site with my Husband. Thank you for sharing and have a great day! Im sure she loved it! What a lovely creative process! 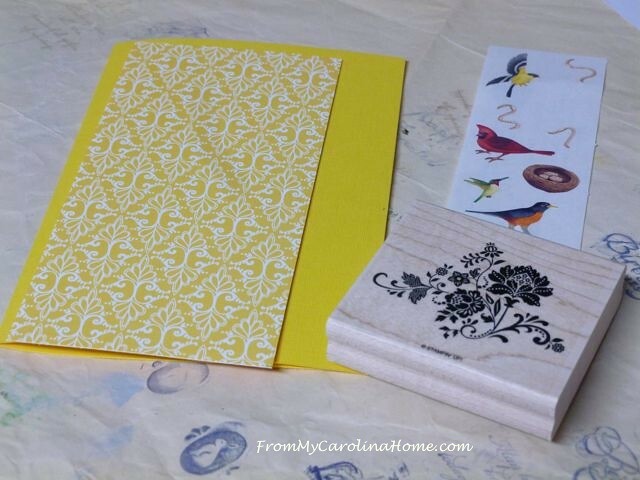 Do you use special tools besides your stamps? A special printer? I have never tried, but intrigued! Thanks for the link to appropriate sayings! Ohboyohboy! Today while volunteering at the Reception desk of our Sr. Center, I finally met a woman I’ve been hearing about & seeing her beautiful hand-crafted cards. 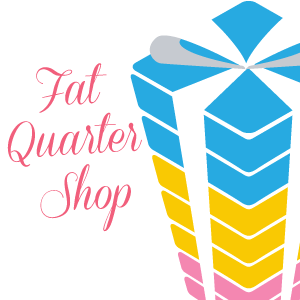 When she finished speaking to the employee, i jumped in & asked if she held card classes. She laughed & said “No, but I’ll help you!” Invited me to come to a monthly group where everyone shares their stamps, punches, ideas.. . .! 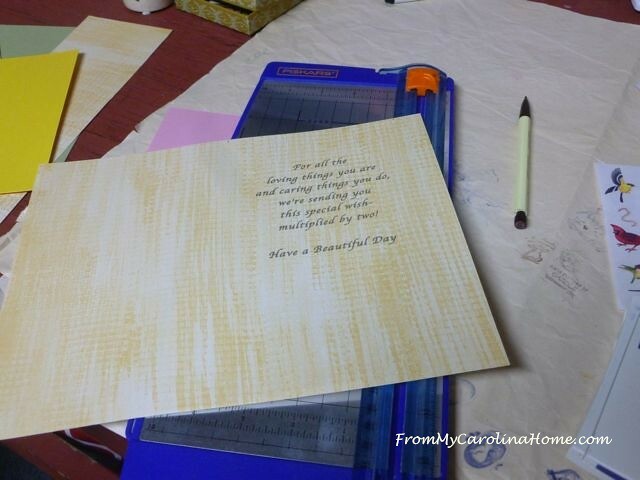 Then I got home & here is your MIL’s card – it is a sign that I’m supposed to do this! Feeling excited, here in Indiana! Today is going to be on the very warm side so staying inside till later in the evening. Your card is so sweet, love the birds and flower theme, glad you showed it later so she wouldn’t see it till she got it, good thinking. Have come up with an idea to make a wall hanging for a friend of 39 years that loves the peacock bird. I have an embroidery of the peacock from a packet embroidery from Antie Annies I think it is, I’m wanting to use and make her a wall hanging using the peacock on the front and a solid backing of the peacock feather backing and sidings along with solid colors as borders on the front. Do you feel the embroidery and backing would be correct together? Marjorie and I both love the peacock and the colorings in the feathers, I’m hoping to find a peacock feather design to use on the backing and the border on the front design. If I do a great enough a job I’d like to enter it into the Fair down in Macon, Ga come this fall. 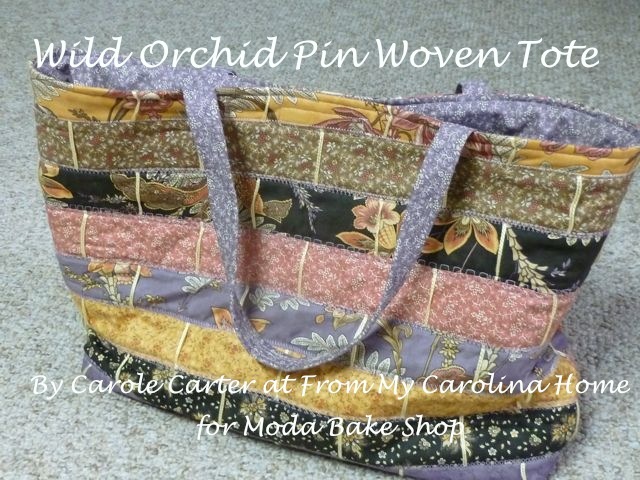 Her birthday is in Sept. , she will be 83 years old and I just want to make something really special for her. Also, I purchased 5lb. pop corn size can of candies from Harry London on QVC last July from their Christmas show and he had a caramel chocolate with sea salt sprinkled on it and I was wondering if you just might have a recipe to make this delicious candy. I put some of them into my gifts for Christmas and all those that got them raved so much about them plus I cann’t get enough of them myself I’d like to make them and save some money plus I want to make them with dark chocolate. I also love the Ghirardelli chocolates, enjoy their specialty candies for Christmas and Valentines days. Answer when you have the time. I love your choice of the yellow — it’s so springy and happy. And the card itself is just beautiful. She’s a lucky woman. I always love it when people take the time to make something. I try but sometimes I run out of time. But this is special. Beautiful! You are so talented! Is there anything you cannot do? That was a beautiful card, and the poem was perfect. Our son came to spend a couple of days with us, and I texted with our daughter in Denmark. Mother’s Day was lovely and low-key. Your card is so lovely with pretty texture. The poem is lovely too. Thanks for joining the Just For Fun challenge. We hope to see you again soon! What a lovely card! Sometimes I really struggle to find the right sentiment matched with the right cover on a ready-made greeting card (not too saccharine, has to be from son and daughter-in-law for my MIL, for example) and it’s great that you can find the sentiment separately and make the perfect card to match. Maybe someday I’ll try it…when I get a few other things done first! 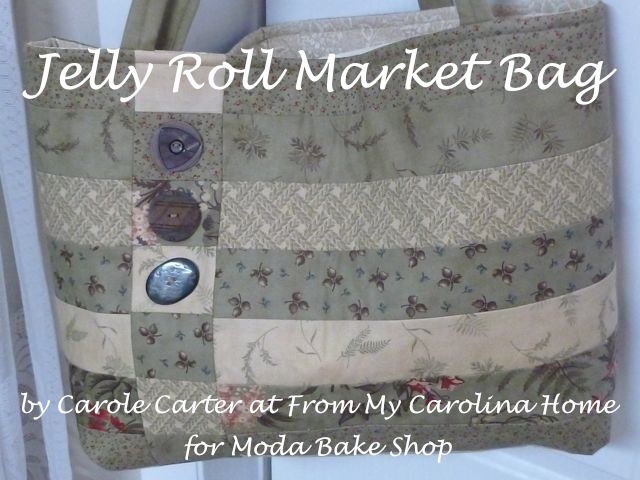 Lovely Carole, I know she was thrilled to receive it, so thoughtful! This is a beautiful card and handmade cards are growing on me as well. It was very quiet and my boys did NOT make me a pretty card … or even an ugly one. LOL Your card is beautiful! 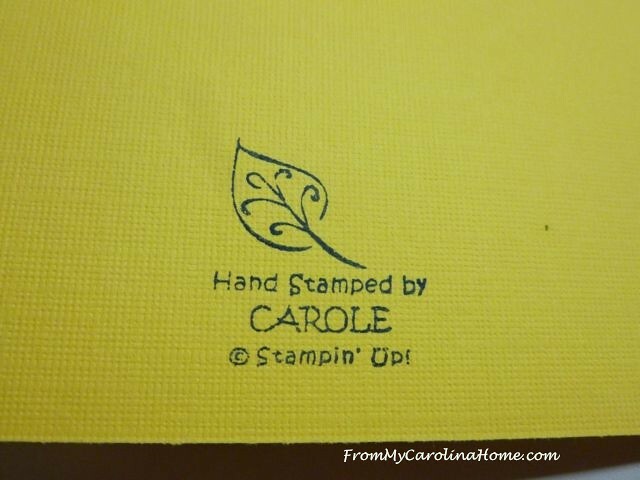 First, let me say that I love your personalized stamp! My mother and mother in law read my blog too, but it’s always a surprise what card I decide to pick for them! Your chalk blending intrigued me, I need to get my chalks out! I love the soft blending look. 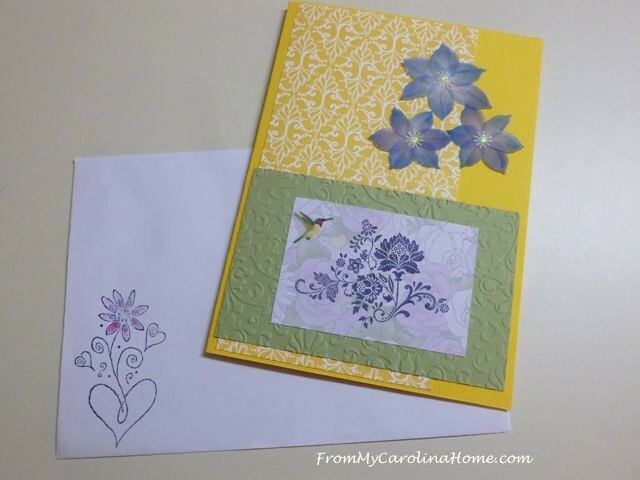 The floral image on the front of your card reminds me of Dutch Delft pieces, so pretty! 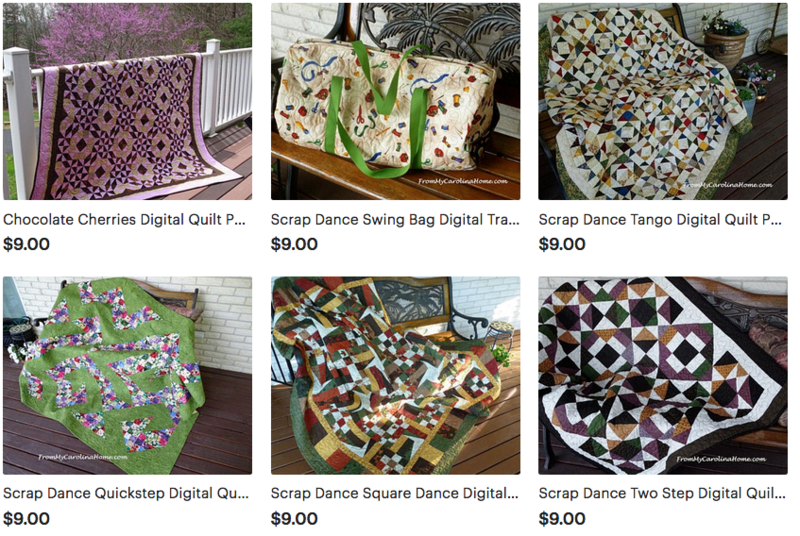 I’m so glad to see your artwork in our Just For Fun challenge this month. Hugs! What a lovely and detailed card! I really love that you used some chalk for adding color. I should get my chalks out again soon. Thanks for sharing with us at Just for Fun!